The demonstrations in conjunction with Human Rights Day today were held in Kuching, Sibu, Bintulu, Miri and also in Kota Kinabalu, Sabah. In Kuching, some 300 mostly Iban and Bidayuh landowners gathered at Padang Merdeka in the city centre. They carried placards and banners denouncing the acquisition or planned acquisition of their land. Miri had the biggest turnout where more than 400 gathered at the Centre Point commercial centre at Jalan Kubu. In Sibu, some 200 landowners took part in a rally at the Chuang corridor in the town square. A group calling itself Gerakan Rakyat Asal Sabah dan Sarawak (Grass), or Peoples Movement of Sabah and Sarawak, said the aim of the protests was to “demonstrate to the authorities that the natives of Sarawak are not happy with the constant violation of their NCR lands and resources by the state government”. “Throughout the years, NCR lands have been unjustly grabbed or destroyed for various development projects such as logging, oil palm and tree plantation estates, hydroelectric dams construction, quarrying and construction of large polluting industries like the aluminium smelter plants,” Grass said in a statement. 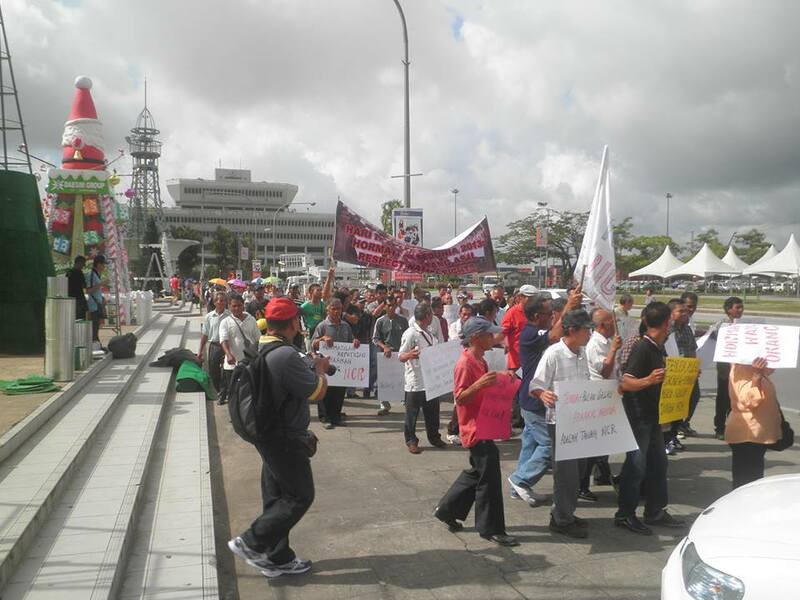 In the Kuching rally, landowners carrying placards and banners with ominous warnings like: “We, the villagers of Entanggor, will defend our land till the last drop of our blood” and “drive off the land thieves from our NCR land”, staged a 1km walk along the city’s busiest roads to highlight their plight to motorists. Kampung Entanggor in Simunjan is 63km away from the city and the 150 villagers from there and neighbouring Kampung Kesindu, boarded two buses before dawn for the five-hour trip to Kuching. They had to cross two major rivers by ferries enroute to the city. The villagers took part in the rally to protest the encroachment into their land and later the eviction by a company which had been given a provisional lease (PL) on the 5,000ha communal land by the state government to open an oil palm plantation. The Samarahan-based company had on November 13 gave the villagers seven days to move out. The company further said that it “reserves the right to take any action deemed necessary to protect its rights over the (land), including filing a legal action to recover possession”. The villagers are reportedly taking a counter legal action against the company and state government. The experience of the Entanggor and Kesindu villagers are repeated among those who took part in the rallies elsewhere. In Sibu, the landowners came from as far as Mukah (93km from Sibu), and Balingian (132km). The Melanau landowners in Mukah, for example, took part in the rally to protest the government’s action of giving the PL on the land to one of its agencies to plant oil palm. There were no reported incidents and police did not attempt to stop the rally participants from marching through the town’s major thoroughfare. This is the price for voting a rotten corrupt government every election, again and again. A small kid will be scared of fire, once been burnt, but you people have not only been burnt once, but numerous times with all the scars still prevalent, yet never learn. to screw, or kena screwed, both way enjoy the actions.